Facts about New Caledonian Gecko. "Scientific name for New Caledonian Giant Gecko is Rhacodactylus auriculatus". The New Caledonian Giant Gecko belongs to the genus Rhacodactylus. The New Caledonian Giant Gecko is native to southern New Caledonia. The common sub species of these geckos include crested gecko, chahoua gecko, gargoyle gecko, Rough-snouted gecko, sarasin’s giant gecko, and the giant gecko. All these sub species live on trees. The New Caledonian Giant Gecko gets its nourishment from amphibians such as frogs and other reptiles such as lizards. It can also feed from insects, spiders, some fruits, nectar and sap from trees. New Caledonian Giant Gecko can attach on tree barks due to claws found on its toes in addition to grasping pad found beneath the tail. On trees, New Caledonian Giant Geckos, can easily camouflage since they are light and dark grey in color. There coloration thus merges with the olive green, pale brown color of barks. New Caledonian Giant Geckos mostly keep away from predators by shedding its tail when threatened, which doesn't grow back during its lifetime. The capillaries found in the tail close immediately preventing the reptile from losing blood. It is also understood that their nocturnal nature helps them evade their predators. New New Caledonian Giant Geckos will grow breeding size after four-five years and can reach a height of 14 inches (36 cm). The eyes do not have eyelids and thus their long tongues act as structures that remove dirt-like materials and to give a moisturizing effect to the eyes to prevent them from drying. Above the eyes, the New Caledonian Giant Gecko has structures that resemble hairs. The New Caledonian Giant Gecko has a short blunt prehensile tail that has a major function during climbing. Its skin is characterized by many folds making it look like a person wearing an oversize shirt. Their toes are long with respect to their long limbs having finely developed lamellae. The New Caledonian Giant Gecko live in areas that are generally hot and dry throughout the year. 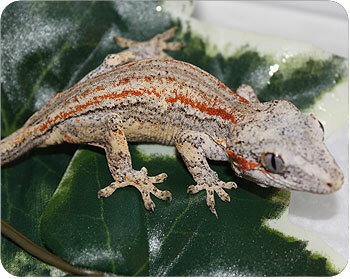 New New Caledonian Giant Geckos mostly the crested one are color hyper variable and their colors can vary from gray, red, brown, or yellow. The temperature and their mood determine the color and the shade they wear at a certain time. The New Caledonian Giant Geckos are found in New Caledonia in the islands such as Isle of Pines, Grande Terre and the surrounding islands in the Pacific Ocean. New Caledonian Giant Geckos are not a major target to most predators ,however, the little fire ants preys on the New Caledonian Giant Geckos by stinging and attacking the geckos in great numbers. The little fire ants compete for food. Female New Caledonian Giant Geckos lay a maximum of two eggs, which hatch in about 60 to 150 days after being laid. Eggs are laid by female in minimum of four clutches with minimum being ten depending on the species. Eggs can be laid four to ten times each year. New Caledonian Giant Geckos that have been bred, however, can lay eggs for four to six weeks if calcium requirements of the reptiles are maintained at optimum. Research shows that, once the eggs are laid, the get glued on tree barks since they are very sticky. New Caledonian Giant Geckos exist in two forms sexually with preanal pores occurring more in males than in females as well as the hemiphene pocket.